OK, I haven’t actually planted much of anything yet, but I’m ready to do so. I just need to get through next week with its threat of frost and then, well, I’ll be planting my tobacco out. I’m looking forward to it too. I’ve been nursing my tobacco for a while now and the 40 selected plants are looking great. I have 20 Virginias and 20 Lizard Tail Orinoco. It’s hard to tell them apart. I think the Virginia will produce a broader leaf, if the seedlings are anything to go by. They are going into patch no.1, alongside my spuds. The Orinoco is going into patch no.2 beside the long haired one’s herbs. I have planted one of each tobacco variety already as a survivability test. I have some reserve plants in case of failure. In fact, I have a whole lot of reserve plants..!! Planting the seeds was a challenge to my failing eyesight and I probably have twice as many plants as I thought I had! A few of those are going to be sent off to a friend to try out in his garden. Then I’ll have something to compare with and who knows, I may be able to get him on the grow it yourself bandwagon too. The more, the merrier. I’ve marked out my rows and prepared the soil as best I can. I’ve dug deep, loosened the soil after a few weeks rest and weeded out today. It’s all pretty much virgin soil apart from the lawn having grown on it for the past lord knows how many years. I have started a compost heap and that will all go back into the soil in the autumn after, hopefully, a good growing season. In fact, I’m going to dig all the left overs back into the soil ready for next year. If the tobacco experiment doesn’t work out, then a veggie garden might be as much fun to try anyway. I thought hard about the price involved in all of this, the effort and the cost of potting materials, tools and other stuff needed just to get going. It hasn’t been exorbitant or extremely expensive. The work involved is initially hard, but one the ground is broken, it isn’t too bad. The best incentive is to imagine the tax collector not getting anything out of me for my tobacco as I fill my pipe with my home grown weed later on. The greedy sod just taxed himself out of my pocket. I don’t mind paying a fair price for anything but once the taxation got too high to be called “fair”, I decided to cut him off. So screw him and the state that employed him. Using taxation to control the behaviour of the people is not a thing that I support in any way, shape or form. OK, I’m down off my soapbox again. Sorry. Here’s a few pictures of my efforts so far. The top 40 plants (in individual pots), my reserve plants (still in the seed tray), and the patches. Lookin’ good, eh? It’s gonna be a long week waiting for that frost to disappear. I’ve never been much of a gardener. My father was. He couldn’t bear to see a patch of earth with nothing growing in it. He had to dig it up and plant something. It always grew. He loved his garden. Me? Not so much. However, now I’ve got the idea into my head that I can grow tobacco and screw the tax man, well, I have to go out and dig. I swear I could hear the old man laughing at me as I toiled with it. Our garden hasn’t really been touched since we moved in around eleven years ago. OK, I’ve trimmed the hedges and mown the bloody lawn (I hate mowing the lawn) but apart from that, nothing much as happened in the earth department. Today, all that changed. I haven’t dug into the soil since I dug fire trenches and foxholes in the army about thirty years ago, so to say I am unaccustomed to this physical effort is a bit of an understatement. Remembering how my father marked out his patch, I drove four stakes into the lawn to give me a border to work to and started swinging my trusty spade. The first bit was hard. Hedge roots and tree roots, bramble and old rhubarb roots all had to go. I found artichokes too. My wife planted them years ago and they produce tubers every year. Add to that the grass, ivy and cooch grass and you can imagine how much time I spent removing the rubbish as opposed to actually digging. 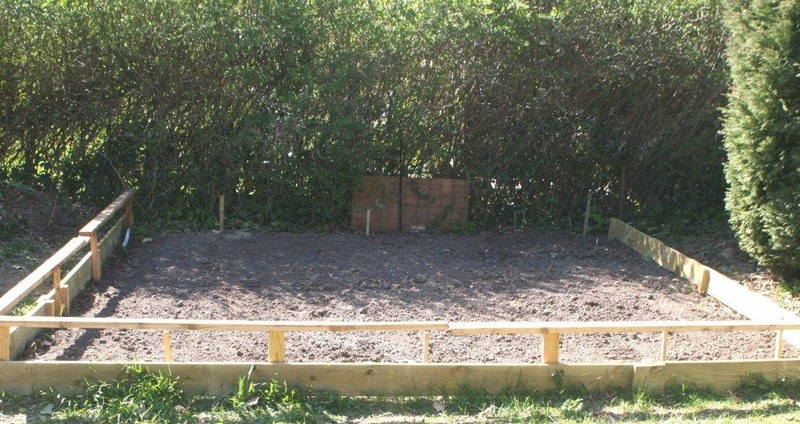 The patch is about 4 x 4 meters, the first of 2 that I intend to cultivate. It will provide the room I need for my Virginia tobacco and a few potatoes. Patch number two, when I get round to it, will be a little smaller but doubtless less difficult to get through as it’s only covered by the lawn now. I dug like a demon. I sweated oil. I cursed, puffed and panted and just as I hit my second wind at the half way point, it started to rain. I had to abandon the project temporarily and seek shelter from the downpour. An hour later and the rain had stopped. Determined to get the job done, I returned to the patch and grabbed my spade and started again. The rain had not helped. The soil was heavier and sticky and the going was tougher than before. Undaunted, I continued and, after an hour or so again, I was finished. Luckily, so was the digging. 16 square meters of newly dug black loam laid out before me. It actually smells good. Really earthy and strangely fresh. And full of worms. I seem to remember that worms are good. The dogs had been keeping a close eye on my labours and, even though they do not understand what is going on, they respected my shouting “Get off my bloody garden”, which is something I also learned from my father many years ago. To ensure they respect the newly tilled soil, I erected a temporary fence in Dachshund defensive height. That will have to do until I can get some woven willow fence to enclose the patch. The plan now, is to let the elements break it down a little before I actually get round to planting anything. 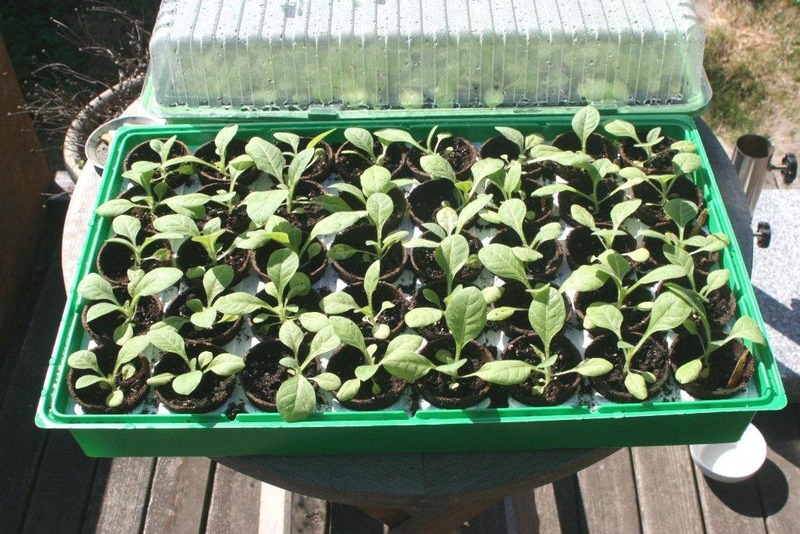 My tobacco seedlings are doing well but it is far too early to consider putting them out yet. 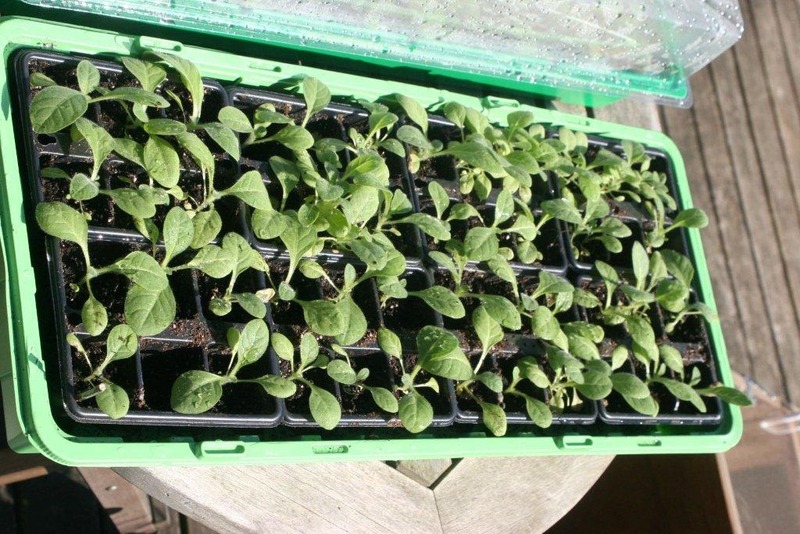 They need to be potted now and placed in the mini greenhouse, which I also had to build, to harden and reach a size fit for planting out. I suppose I could get my spuds down though. I’ll have to make a decision regarding that soon. Right now, I ache all over and have pain in places I didn’t know I had. The visual satisfaction is enough to compensate though. The effort was well worth the result and I‘ll be back out there sometime later in the week to start patch number two. One small notice of belated appreciation has to be placed here. I have done less than one tenth of what my father did, every year, in the garden today. He fed a family of seven from his garden and allotment. My mother rarely had to buy vegetables. Feeling as I do now, I have nothing but respect for that monumental effort he put into the soil. I hope he can see me now, wherever he may be, and is content with my poor accomplishment.